Last Saturday a unique 17th-century bullet proof siege helmet was transferred from a church in the Frisian village of Schettens to the Dutch National Military Museum. 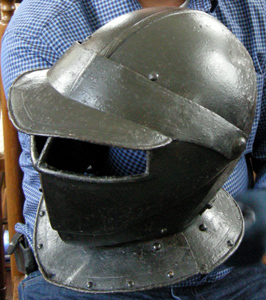 The helmet is a unique specimen dating back to the Eighty Years’s War (1568-1648) of the Low Countries against Spain. It belonged to Schelte Hotzes van Aysma who was a colonel in the armies of the protestant princes of Nassau. 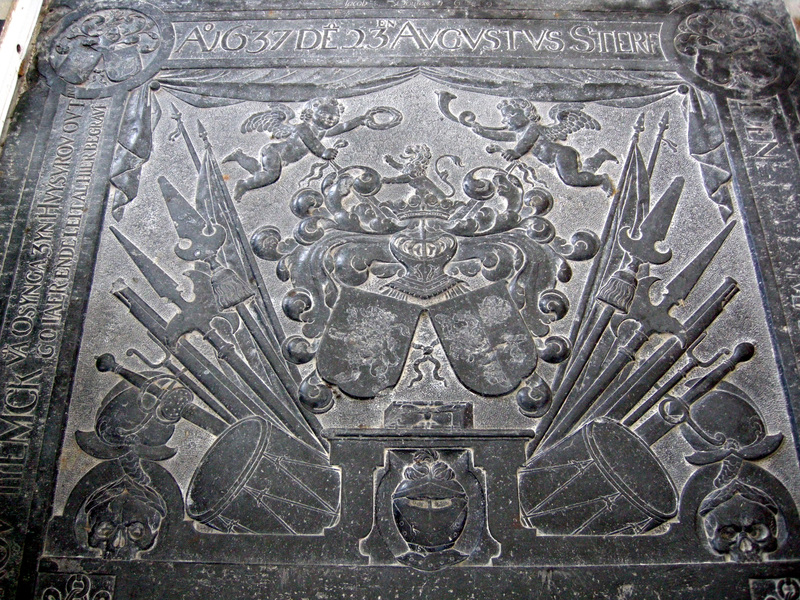 Van Aysma died on 23rd August 1637 during the siege of Breda. His mortal remains were transferred to Schettens where his family had its home base. The helmet is bullet proof and its heavy weight indicates that it was used as a siege helmet/ The helmet and his rapier may originally have been attached to a memorial plaque that was attached to a wall of the church. That memorial plaque apparently has been lost. Until recently the helmet and the blade of the rapier were hung at the inner wall of the church's tower, where they were slowly rusting. A year ago I received an e-mail by Jeroen Punt, curator of the National Military Museum in Soesterberg. 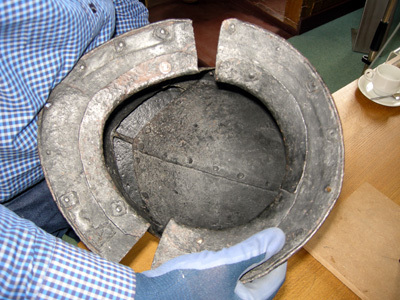 Punt was doing provenance research on 17th-century helmets in his museum. 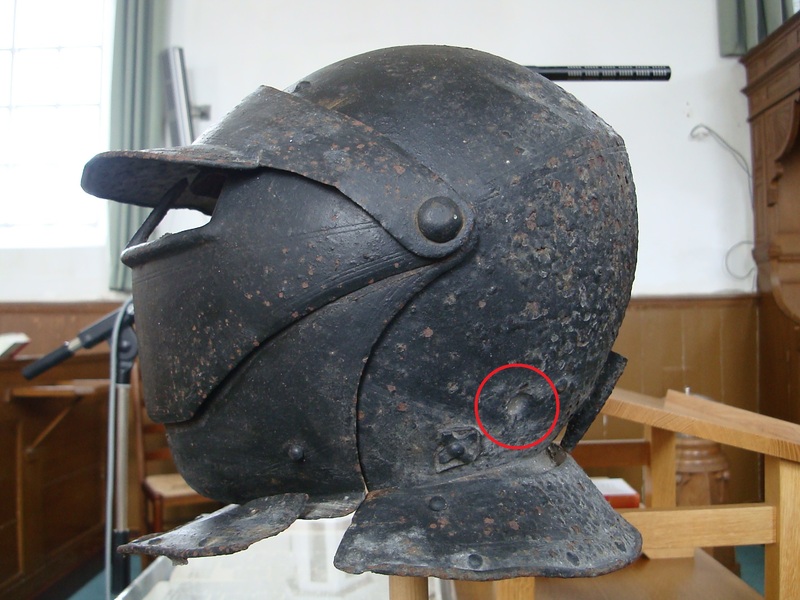 Out of curiosity he went searching on the internet an found a vague picture of a helmet in the church of Schettens. "Please keep this secret for the time being," Punt emphasized. "It appears to be a unique closed helmet of which I could find one somewhat similar specimen in the Museum of Chicago. Such rare helmets have a value. There have been cases of theft from English churches. It should better be kept safe in our museum." It was not immediately clear to whom the helmet belonged. 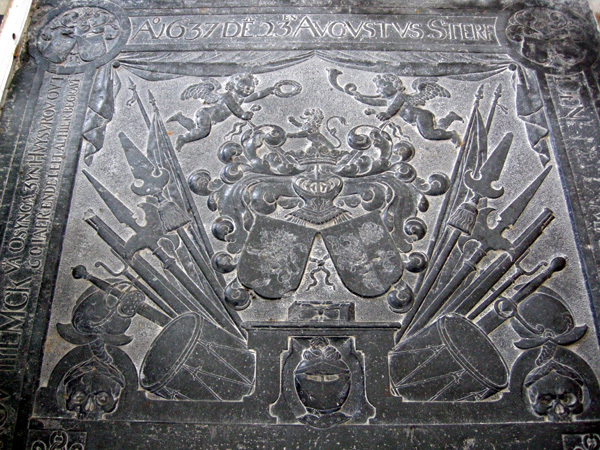 But Punt noticed that colonel Schelte van Aysma was buried in the church, though his slab was now out of sight due to a wooden covering of the path to the altar. When the wooden plates were removed the slab could be inspected. 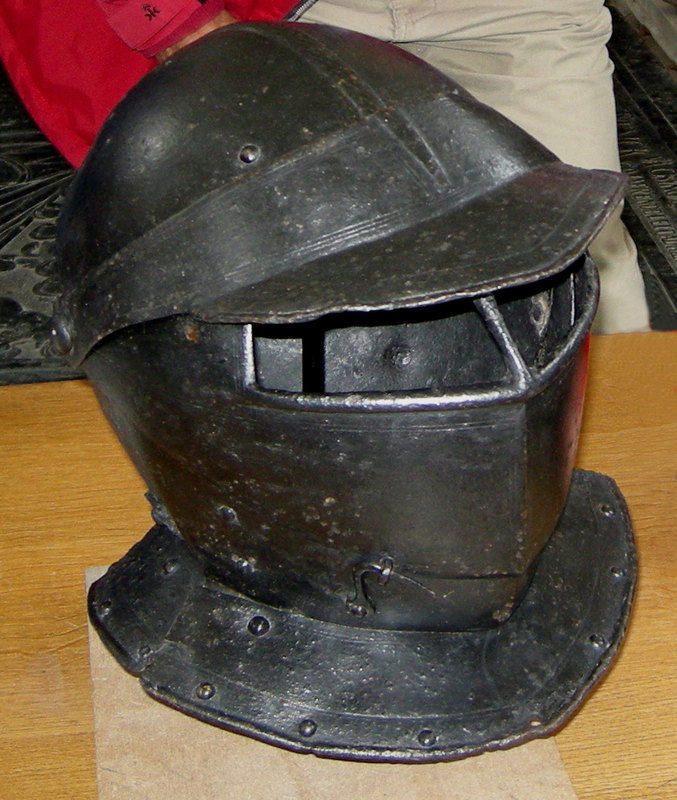 An image of exactly the same type of helmet was found chiseled in the slab. 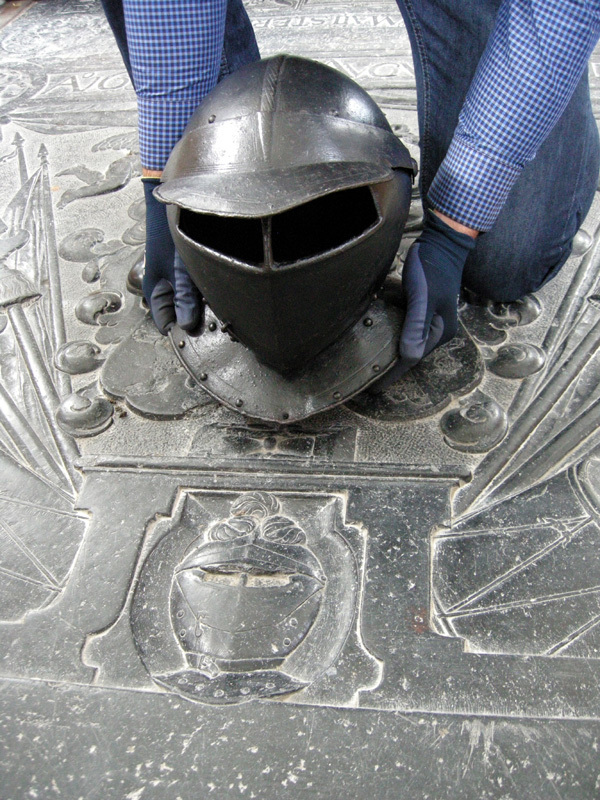 The helmet is nearly identical to the image that was chiseled on the tomb slab. 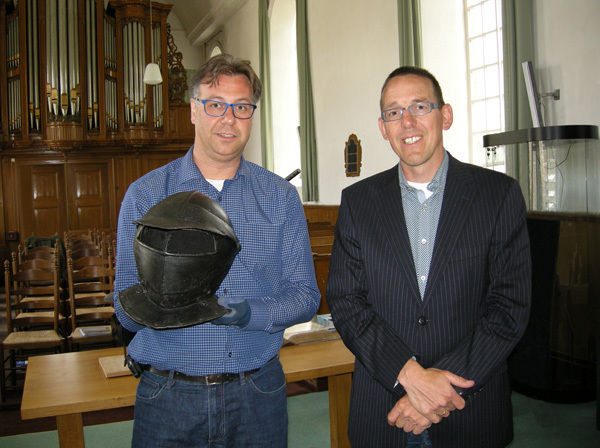 Punt took the 5.2 kilogram heavy helmet to Soesterberg for restoration. The church approved that it will remain on loan there. The museum provided the church with an exact 3D print of the helmet together with a replica of a rapier, a glass showcase and a billboard explaining the story of the helmet. 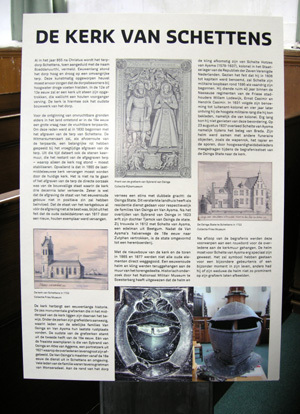 Billboard (in Dutch) about the history of the church of Schettens and explaining the whereabout of the helmet.